The Combined Services Boxing Association (CSBA), comprising the Royal Navy Boxing Association, the Army Boxing Association and the Royal Air Force Boxing Association, is affiliated to the Amateur Boxing Association of England(ABAE). 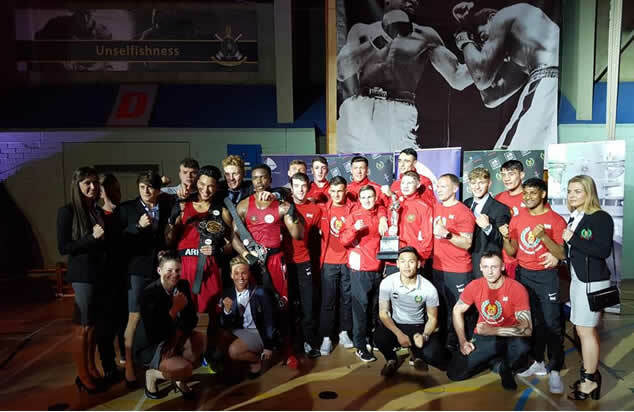 The CSBA, together with its boxers and officials, is highly regarded within ABAE and over recent years has produced ABAE Senior and Novice Champions, International boxers and a number of England, European and World Major Panel Officials. CSBA Championships at Novice and Senior level are held annually to qualify boxers for the respective ABAE National Championships and to determine Inter Service Championship Individual and Team Titles – the Novice Championships are usually held in October at the Royal Star & Garter Home in London, the Senior Championships are usually held in March at Aldershot,Portsmouth or Cranwell. Details of the Championships are on CSBA Novice Championships and CSBA Senior Championships pages. The Championships for Senior Class Boxers (Open Class) are usually held in March, at HMS Nelson, Portsmouth, Army Boxing Centre, Aldershot or RAF Cranwell and are a qualifying round of the Amatuer Boxing Association England (ABAE) National Senior Championships. One boxer each from Royal Navy, Army and Royal Air Force are selected by their respective Team Coaches to enter the championships in weight category. Any semi finals (three entries in one weight) are boxed the day prior to the Championships Finals. In addition to Individual Titles, the Inter Services Team Championships are decided at the event. The winner of the individual title gains one point towards the team competition. One point is awarded for a walkover. The winning team is the team with the most points. In the event of a tie on points the current Service Title holders will retain the title. In the event of this still not producing a winner the Service with the greater number of finalists will be declared the Team Champions. The Team Champions are awarded the Noble Statuette. This splendid silver trophy was first presented in 1922 to the winners of what were then the Imperial Services Boxing Association (ISBA) Championships. Later the title was changed to the Combined Services Boxing Association. The Imperial Services Boxing Association Championships were instituted in 1919, in which year the Australian, New Zealand, Canadian and South African Expeditionary Forces also competed. The championships took the form of individual championships with separate categories for Officers and Other Ranks. In the years 1923, 1924 and 1925 the championships took the form of Inter Service Team Championships between the Royal Navy, Royal Marines, Army and Royal Air Force. In 1925, the individual system was reintroduced and the open ISBA Championships held in abeyance. The ISBA Amateur Championships were instituted and Officers and Other Ranks competed with one another to find the individual champion. In 1931, the old ISBA Team Trophy was put up by the Royal Navy (holders) as an Amateur Team ISBA trophy. In 1932 the Territorial Army entered a Team for the championships, to make it a four sided competition between the Royal Navy & Royal Marines, the Army, the Royal Air Force and the Territorial Army. In later years the championships comprised of each service boxing against each of the other services. The Army Boxing Team is the current holder of the Noble Statuette, having won the Title for 26 years in succession.